The Bihar Public Service Commission (BPSC) has released the BPSC Official Notification 2019 regarding the BPSC Assistant AE Recruitment 2019. The recruitment holds the Assistant Engineer(Civil/Electrical) vacancies. 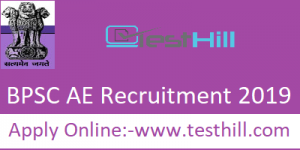 All the details regarding the BPSC Assistant Engineer (AE) Recruitment 2019 are available below. Scroll down to know more about it. The registration for the BPSC Assistant Engineer (AE) will be started on 19 March 2019. Candidates who want to be a part of the BPSC has a good chance to apply for the BPSC Assistant Engineer (AE) 2019 Recruitment 2019. Now, all interested candidates out there are advised to read the BPSC Official Notification 2019 to check their eligibility for this recruitment. Because only eligible candidates or applications will be accepted by the department else they might reject at any time of recruitment. So, read the notification carefully and act accordingly. There are a total of 147 posts for the declared recruitment. BPSC Assistant Engineer (AE) Official Notification 2019 has released by the department. Candidates who want to be part of the BPSC can apply for the same. Applicants are advised to read the whole notification carefully before making the online application. BPSC Official Notification 2019 is available on the official website else they can download it from this article as well. We’ve provided the direct link of BPSC Assistant Engineer (AE) Official Notification 2019 in the table below. So as we know the applications for the BPSC Assistant Engineer (AE) Recruitment 2019 will be started on 19th March 2019. Candidates who interested in this recruitment and going to apply for the same have to check their eligibility prior to making the online application. They can all the future updates on this webpage. So, stay tuned with us to check all the detailed information regarding the BPSC Assistant Engineer (AE) Recruitment 2019. The last date to apply for BPSC Recruitment is 2 April 2019. All candidates have to apply before the last date to avoid any hassle.